VICE has an article out which serves as a friendly reminder what’s at stake over the next few months. Setting aside the sensational elements of the piece, this is the social unrest that austerity and prolonged economic crisis creates. The Olympics are set to be a polarizing event when they come to London in late July. If there isn’t some resolution that offers a glimmer of hope by then these games could be remembered for all the wrong reasons. A lot of young people agree with the leftist notion that the Olympics are nothing more than “ensuing spectacle of wealth and escalating police state.” Fortunately, the vast majority of world firmly disagrees and will be there to oppose them. Soros said they’ve got 3-months to get things sorted structurally. The clock is ticking. When you think of terrorist groups, you usually think of al-Qaeda casually flying planes into buildings, or Japanese cultists pumping sarin gas into subway stations, right? Do you think of a bunch of left-wing types pulling up on mopeds outside the home of a nuclear engineering executive and mercilessly kneecaping him? ‘Cause I don’t. Or at least, I didn’t use to. 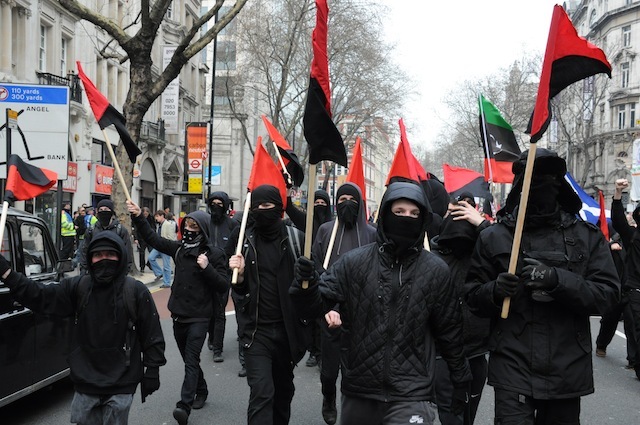 The shooting took place on May 7 in Genoa, Italy, and responsibility was claimed (in a letter sent to a newspaper) by a group calling itself the Olga Nucleus of the Informal Anarchist Federation, or IAF. The victim, Roberto Adinolfi, was the CEO of a nuclear energy firm owned by the Italian State Defence group, Finmeccanica. In their letter, the IAF said they targeted Adinolfi because, “before nuclear power fell into disrepute, he [Adinolfi] was amongst the key players… responsible for the re-introduction of nuclear power in Italy…” According to them, science has sold out, “leading us to auto-destruction and total slavery.” The IAF think it’s only a matter of time before Europe, with its 187 nuclear power plants, has its own Fukushima, and they see this attack as a precursor to the eventual abandonment of nuclear power. Adinolfi may have been an easy target, but in the letter they warn that this attack is just the beginning and that Finmeccanica will be targeted a further seven times, one attack for each of the Greek anarchist members of the Conspiracy of Fire Nuclei currently in prison. Will This Summer Belong to Europe’s Far-Left Terrorists?